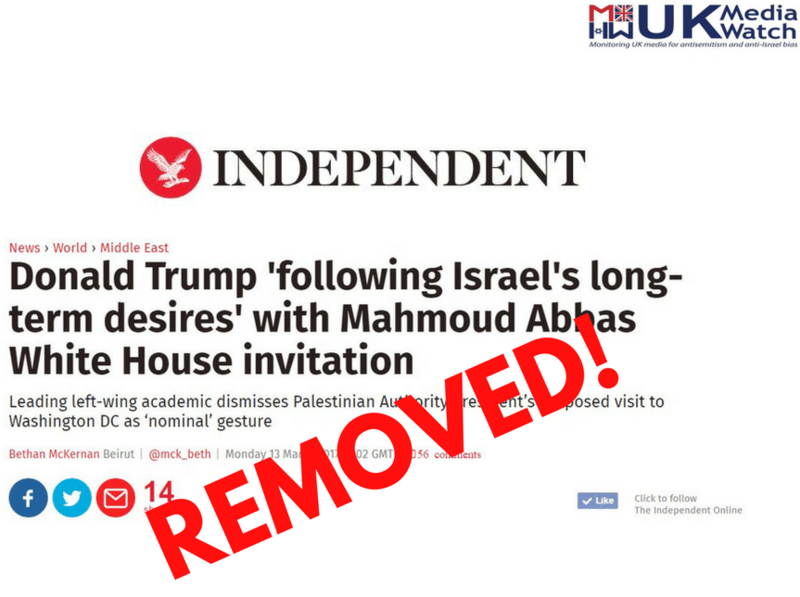 Earlier in the month, we posted about an article in the Independent which contextualized an article on Donald Trump’s White House invitation to Mahmoud Abbas by highlighting the “analysis” of someone named Ralph Schoenman. The article, by their Middle East correspondent Bethan McKernan, was based on comments by Schoenman, who she surreally characterised as a “leading academic” and author of a “highly influential” book about Zionism. As we revealed in our post, however, Schoenman is a fringe extremist, 9/11 conspiracy theorist and fraudulent scholar who has erroneously claimed that Jews dominated the slave trade. In his “influential” book (Hidden History of Zionism), he alleges that pre-state Zionists collaborated with the Nazis to murder millions of Jews and then, when the state was born, “emulated the Nazis” in planning and carrying out their own genocide against Palestinians. As we argued at the time, of all the political analysts to seek comment, it’s remarkable that McKernan chose an extremist who’s engaged in smears about Zionism’s putative relationship with Nazism so vile and ahistorical that they’d likely make Ken Livingstone blush. But I wouldn’t want to call the Independent a bunch of anti-Semites. That might make them cry. They removed the article. I’ll give them credit for that. It’s better than some of the corrections these newspaper make which are often as scuzzy as that which they are supposed to be correcting (see “UKMW prompts Guardian correction to Western Wall photo caption” for one example). That they have a correspondent such as Bethan McKernan in their employ is concerning. That may be the case, but we can’t sit back and act like it’s normal that they keep doing it. This is a systematic failure at the Independent. All responsibility is theirs. The Independent does not advise its readers that Ben White is an extreme anti-Israel activist. Ben White has certainly found his life’s calling. What a waste of a life. Usually unreliable statistics claim that Jews have more education, publish and write and read more books, and earn on average only ten per cent higher incomes. My personal observation is that they usually have Ashkenazi, ambitious moms. You mention “Usually unreliable statistics…” On what basis do you base your personal observation? How many cases have you examined? Are your statistice reliable or is it just a gut feeling? And just supposing you were right, what crime is an Ashkenazi ambitious mom committing? Great job, Adam, getting this removed. 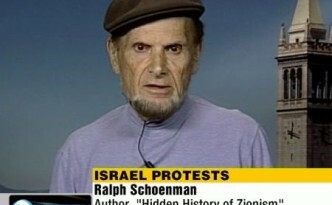 Noting that “it’s remarkable that McKernan chose an extremist who’s engaged in smears about Zionism’s putative relationship with Nazism so vile and ahistorical ” reminds us that behind Bethan McKernan’s smiling face on her twitter account lies a morbid hatred of Jews and a willingness and even eagerness to believe the words of someone like Ralph Schoenman. The larger question is why the Independent hires someone like her – are they similarly afflicted? WHOM, ffs, not “who she surreally characterised”.